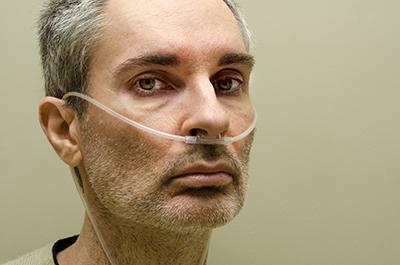 Sept. 8, 2017–People with severe emphysema may breathe better after a minimally invasive procedure that places valves in the airways leading to diseased portions of their lungs, according to a randomized, controlled trial published online in the American Thoracic Society's American Journal of Respiratory and Critical Care Medicine. The authors note that previous studies of the valves, which are placed using a bronchoscope, found that for patients with severe emphysema, this minimally invasive therapy represents an alternative to lung volume reduction surgery. Patients undergoing endobronchial valve (EBV) therapy appear to experience similar improvements in lung function, shortness of breath, exercise intolerance and quality of life–without the morbidity and mortality previously associated with surgery.